April showers mean spring is here (or at least nearby), so let’s turn up the heat with more roller derby action! This time, the Foxy Rollers will meet up with the Deathbridge Derby Dames on the track at another fully licensed event at the Cypress Centre. Just a few short years ago, the Foxy Rollers travelled to Lethbridge, AB to play their first ever official derby bout against the Dames. Now we are welcoming them to our home track and are excited to show them what we’ve learned. Come out and support the Kidney Foundation! Time: Doors open at 6:00 p.m., first whistle at 7:00 p.m.
We are excited to announce that we have several home bouts scheduled for the 2014/2015 season! Check our website or our Facebook page for more details. The pot of gold at the end of this rainbow is some fast-paced roller derby action! The Foxy Rollers are back with yet another home game. This time, they’re taking on the Tar Sand Betties from Fort McMurray, AB – another first-time match up. Sporting events are more fun with a crowd, so bring your cheering voices and be our lucky charms! And don’t forget to wear something green so the leprechauns don’t pinch you! The Foxy Rollers will be playing their first ever home game in Medicine Hat on February 1st. 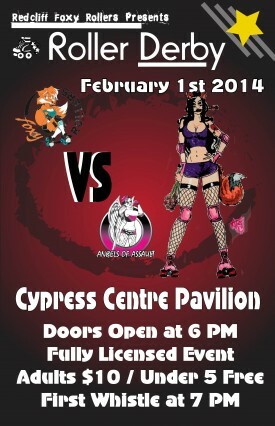 They will be playing against the Angels of Assault from Lloydminster, AB at the Cypress Centre Pavilion. Doors open at 6:00 p.m. and the first whistle will be at 7:00 p.m., which will kick off a fun-filled night of derby action! Admission is $10.00 for adults, $2.50 for those 12 years of age and under, and if you’re under 5 years old, then you get in FREE! Tickets will be available at the door. Both teams have been working hard and are very excited to be playing. 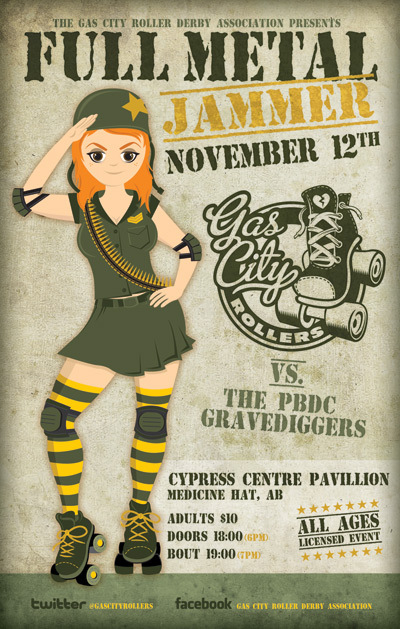 The Gas City Roller Derby Association presents Full Metal Jammer, our first home game of the season against Regina’s Gravediggers. A great event for the whole family to enjoy, doors open 6PM and the bout starts at 7PM, at the Cypress Centre Pavillion. Admission is $10. Come check it out! Roller derby is back from a summer hiatus and your local league is pumping up the heat with 3 games in 1 day and presenting our first ever co-ed bout! Men and women battle it out on the flat track for the first time in our city and the mixed game will truly put the battle of the sexes to the test. 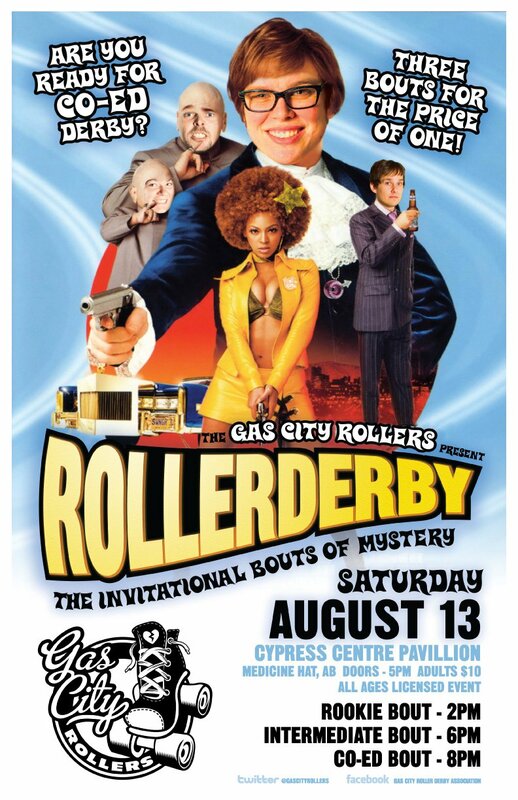 The Gas City Rollers present, “The Invitational Bouts of Mystery” Aug 13 at the Cypress Center Pavilion. The event will feature 80 skaters from leagues in the prairies near and far and features some of the fastest rollers from both Alberta and Saskatchewan! Hatters of all ages will enjoy coming out to watch this full contact sport and enjoy the spills and thrills of the fastest growing sport in the world. This Austin Powers’ themed event features a rookie game at 2 pm, Intermediate game at 6pm and presents our first co-ed game at 8pm! Rookie game is free to the public, everybody is welcome and doors open at 1 pm. Intermediate and Co-Ed games are $10 for both games, $2.50 for children under 12. Doors open at 5 pm for the night games. 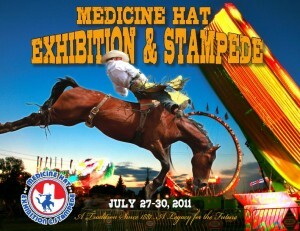 Pre-sale tickets are available at Lavish Apparel or by phone at 403-526-2022. For more information find Gas City Rollers on Facebook, Twitter or email us at: media.gascityrollers@gmail.com. All of the participating organizations share the belief strong public services are important to all Albertans. They also share a belief that Alberta is a very wealthy place and that we can afford them. The only thing that’s standing in the way of maintaining strong public services in Alberta is lack of political will. We can afford to maintain and strengthen public services by fixing Alberta’s broken system for revenue generation. Door Prize tickets are $2 each or 3 for $5 and the proceeds will go to the Medicine Hat Parent Link Centre. Charity Bake Table – KIDS! Decorate your own cupcake! Airbrushing – Get those toes ready for summer! Try your hand at cardmaking! Many great companies to discover including: Epicure, Stampin’ Up, Dress Your Lashes, BeautiControl, Inspired!, Mary Kay, Pampered Chef, Scentsy, Avon and so much more! More than 40 home businesses in attendance! Just a reminder that next Thursday, December 2nd is our Olde Tyme Christmas on the Stampede Grounds in Pioneer Village. FREE admission, hot dogs, hot chocolate, hay rides, and candy canes. With a visit from Santa and Rroary the Tiger, plus choirs from Eagle Butte and Crestwood schools and the “Town Crier”. Be sure to also take in the Olde Tyme Christmas Market in the Cypress Centre. You are currently browsing the archives for the Cypress Centre category.